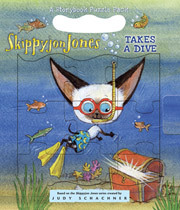 When Skippyjon Jones looks into his goldfish bowl, he's struck with inspirationhe wants to become a deep-sea diver and find the perfect pearl for Mama. The book's "take-along" format has it all! There's a carrying handle perfect for little hands, a simple story about a favorite character, a jigsaw puzzle, and a coloring page that sits behind the puzzle.